Notes: Carried cover with Railway Letter Stamp and Cachet. The above Royal Mail Liverpool & Manchester Rly stamps were issued on 12 March 1980 by Royal Mail and feature the following stamp designs: 12p 'The Rocket'; 12p First & Second Class Carriages; 12p Third Class Carriage and Sheep Truck; 12p Horsebox and Carriage Truck; 12p Mail Coach & Goods Truck. 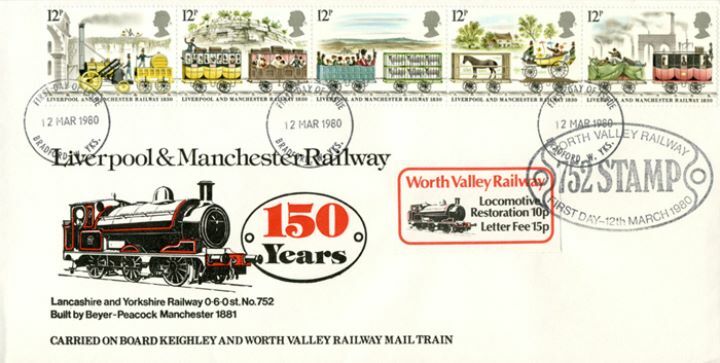 The Worth Valley Railway first day cover with the Bradford FDI Postmark postmark has been produced by Keighley & Worth Valley Rly and features these stamps which can make a very collectible and lovely gift.